Glacier mass balance is the direct and undelayed response to atmospheric climate change and hence is among the essential variables required for climate system monitoring. Glacier melt contributes to runoff and has been recognised as one of the largest non-steric contributor to sea-level rise. With the reference glaciers, the WGMS aims at providing a reliable and well documented sample of globally distributed long-term observation series to document the impact of climate change on glacier mass-balance. The reference glaciers have more than 30 years of ongoing glaciological mass-balance measurements. As an essential climate variable, these glaciers build the backbone of the observational network of the WGMS within the Global Climate Observation System in support of the United Nations Framework Convention for Climate Change. Preconditions: the glacier fluctuations are mainly driven by climatic factors and must not be subject to major other influences such as avalanche, calving or surge dynamics, heavy debris cover, artificial snow production or ablation protection. Length of time series: the glacier must have a time series of more than 30 years of ongoing mass-balance measurements based on the glaciological method. Observational gaps: the observation series may have a maximum gap of three years in the past three decades. In case of larger data gaps, the renewed observations need to cover a time period of at least half the length of the preceding data gap in order to regain the status of a reference glacier. Note that for years of measurement gaps, mass balance estimates (e.g. based on snow line observations or meteorological modelling) can be reported with corresponding flags and information about the estimation techniques. Validation and calibration: it is encouraged to periodically reanalysis and – if necessary – calibrate the glaciological balance series with results from high quality products of about decadal geodetic surveys (cf. Zemp et al., 2013). The status of a reference glacier will be awarded and periodically re-evaluated by the WGMS based on the submitted data and in consultation with the corresponding Principal Investigators. 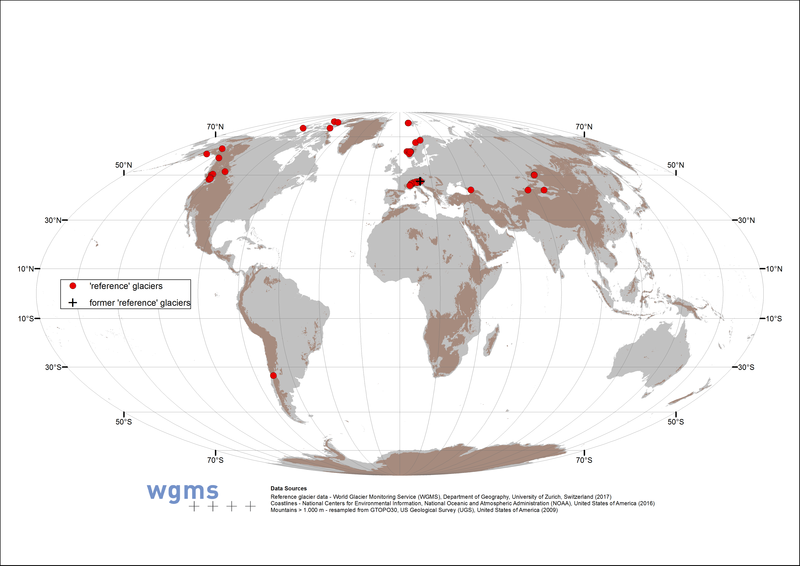 The reference glaciers are highlighted in the online and print products of the WGMS. This page provides detailed information on those reference glaciers given in individual factsheets (see list below). The factsheets are designed to provide clear information and data to anyone interested in learning more about the reference glaciers. For access to the full data set on the reference glaciers, click here. Meta Data Browser. Accessible at: http://www.wgms.ch/fogbrowser/. WGMS (2017): Global Glacier Change Bulletin No. 2 (2014-2015). Zemp, M., Nussbaumer, S.U., Gärtner-Roer, I., Huber, J., Machguth, H., Paul F., and Hoelzle, M. (eds. ), ICSU(WDS) / IUGG(IACS)/ UNEP / UNESCO / WMO, World Glacier Monitoring Service, Zurich, Switzerland, 244 pp., publication based on database version: doi:10.5904/wgms-fog-2017-10. WGMS (2012). Fluctuations of Glaciers 2005-2010, Volume X. Zemp M., Frey H., Gärtner-Roer I., Nussbaumer S.U., Hoelzle M., Paul F. & Haeberli W. (eds. ), IUCN(WDS)/IUGG (IACS)/UNEP/UNESCO/WMO, World Glacier Monitoring Service: Zurich. WGMS (2013). Glacier Mass Balance Bulletin No. 12 (2010-11). Zemp, M., Nussbaumer, S.U., Naegeli, K., Gärtner-Roer, I., Paul, F., Hoelzle, M. and Haeberli, W. (eds. ), ICSU (WDS) / IUGG (IACS) / UNEP / UNESCO / WMO, World Glacier Monitoring Service, Zurich, Switzerland: 106 pp. Zemp, M., Hoelzle M. & Haeberli W. (2009). Six decades of glacier mass-balance observations: a review of the worldwide monitoring network. Annals of Glaciology, 50, 101-111. Zemp, M., Thibert, E., Huss, M., Stumm, D., Rolstad Denby C., Nuth, C., Nussbaumer, S.U., Moholdt, G., Mercer, A., Mayer, C., Joerg, P.C., Jansson, P., Hynek, B., Fischer, A., Escher-Vetter, H., Elvehøy, H. & L. Andreassen (2013). Reanalysing glacier mass balance measurement series. The Cryosphere 7, 1227-1245.